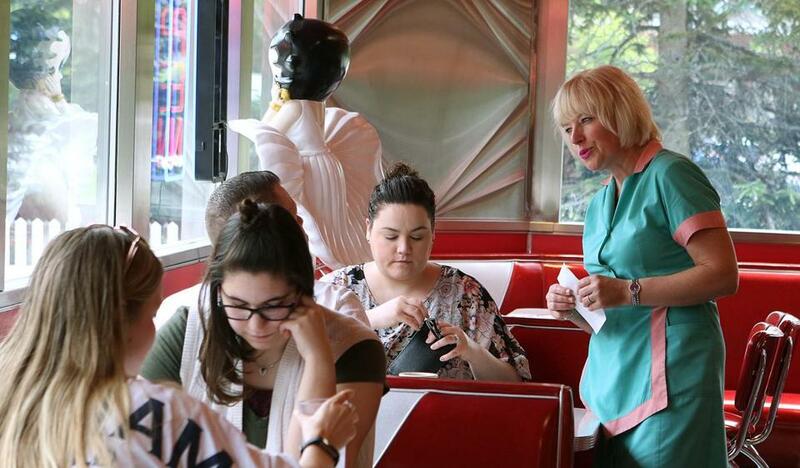 Marybeth Shanahan waits on customers at her diner, the Dream Diner. Nothing stands still at the Dream Diner. Not the ceiling fans that whir 10 feet above the red and silver booths. Not the two veteran waitresses, impeccable in their black uniforms and coiffed hair, gliding across the black and white checkered floor. Not the cook in the red T-shirt, his back to the counter, cracking eggs over the grill. But the land speed record goes to the boss. In 1997, Shanahan was 26 and working as a general contractor and travel agent when her mother called to tell her the doughnut shop at 384 Middlesex Road in Tyngsborough was up for sale. It would make a great diner. Check it out, Bridget Trepsas urged, knowing that running a diner was encoded in her her daughter’s DNA. Shanahan had grown up in her family’s Four Sisters Owl Diner in Lowell, greeting customers, taking orders, and serving plates of food when she was still in elementary school. Two of her aunts — her mother’s sisters Rosie Gauthier and Martha Kataftos — had later opened diners of their own. Running a diner required a medley of skills, everything from hiring and cooking, to bookkeeping, doing taxes, ordering, and cleaning the floors and bathrooms. It would be more difficult for a young woman, people said, because the business was still a man’s world, and a tough one at that. Deliverymen, contractors, and even hired help were likely to resent her authority and ambition. “Most people said, ‘You can’t do it! Diners are brutal. Even her closest confidant, said, ‘Don’t do it,’” says Patrick. From the beginning, Shanahan set her sights on her dream: a vintage O’Mahony model, like the Owl, moved onto the lot where the stick-built diner stood. In the interim, she christened her business the Dream Diner and named the 36 omelets on her menu after diner manufacturers. The Barriere, for example, was made with linguica and cheese. The Worcester included ham, broccoli, mushroom, and cheese. The O’Mahony had tomato and cheese. 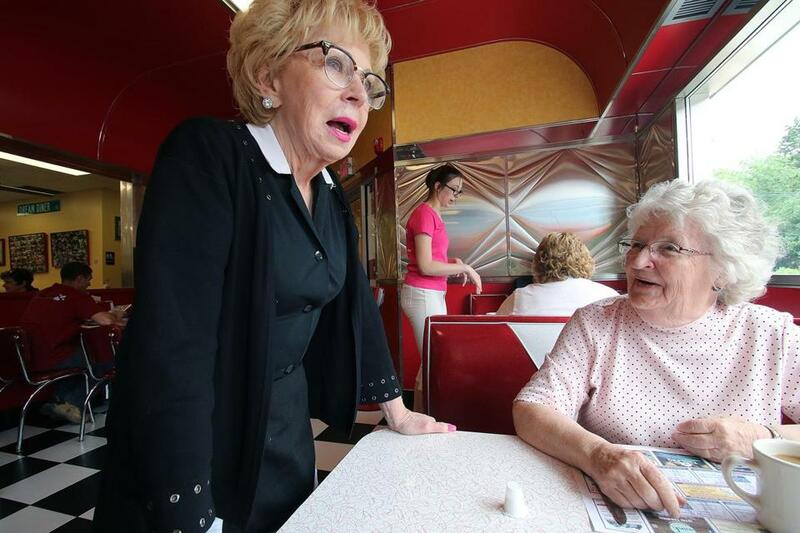 Bridget Trespass, of Salem, N.H., waits on Carolyn Gianoulis at the Dream Diner. Trespass is the mother of the owner, Mary Beth Shanahan. Two years ago, Shanahan contacted Steve Harwin, operator of Diversified Diners, an Ohio company that restores, sells, and moves antique diners, and also reproduces and sells panels and other decorative parts. “She wanted to place an original diner on her site, but we couldn’t find a diner in her time frame, and there are only so many old diners, and they rarely have 60 to 70 seats,” says Harwin, who told Shanahan she would need two or three diners to double her capacity and meet building and safety codes. Instead, she opted for a renovation, completed on March 10, channeling the past with shiny, stainless steel reproductions made by Harwin to fit an architect’s plan. She also added an outdoor dining area with four picnic tables and five round tables. The restoration took five months, disrupting the flow of traffic in and out. But Shanahan, who served as general contractor and ran the diner at the same time, did not close, even for a day. “There were so many moving parts, and she pulled it off,” says Harwin. On a recent Friday morning, Shanahan scans the room as if she had eyes on every side of her head: A customer who just walked in needs to be greeted. Who’s waiting for an order? Who needs more coffee? “Hello, Tim!” she calls to Tim Lieto, a regular from Acton, hurrying over to his booth for some catching up. The diner is filling up. Meat sizzles on the grill. The Platters’ “Great Pretender” blares over the intercom. Every week, the Dream Diner goes through 60 pounds of coffee, 300 dozen eggs, six gallons of butter, 120 cinnamon rolls, and mountains of English muffins needed for its signature eggs Benedict. In the old days, when diners were smaller and located in downtowns, patrons often sat looking out the window onto the street. Some sat alone, lost in their thoughts. Others struck up conversations with strangers at the counter, or with the waitress and cook. But the connections that were once natural now require effort: a greeter at the door, introductions at the table, and the one-on-one attention make people feel at home. A longtime waitress named Doreen logs 24,000 steps on her FitBit every day, takes orders on an electronic device, and credits Shanahan for the “positivity” that drives the operation. 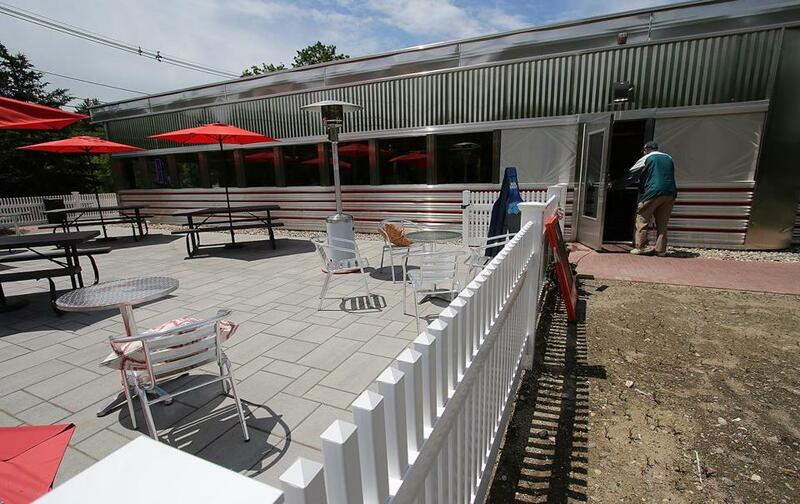 “Throughout it all, we’ve never lost the personal touch,” says waitress Mary McAnistan, a Tyngsborough resident who has worked at the diner since it opened 20 years ago. But “the Tom Brady of Diners,” dressed in a turquoise uniform with pink trim, her only concession to makeup a stripe of bubblegum-colored lipstick, sums things up with the motto on her coffee mug. “If you can dream it, you can do it,” she says, waving her victory banner. Marybeth Shanahan served as general contractor during the renovation, which added an outdoor patio. Hattie Bernstein can be reached at hbernstein04@icloud.com.